MUZAFARABAD, Pakistan — Pakistan's military said Wednesday it shot down two Indian warplanes in the disputed region of Kashmir and captured a pilot, answering an airstrike a day earlier by Indian fighter jets inside Pakistan and raising tensions between the nuclear-armed rivals to a level unseen in two decades. Within hours Pakistan's Prime Minister Imran Khan went on television urging peace talks with Indian Prime Minister Narendra Modi, saying both countries needed to step back from the brink and warning that "miscalculations" could drag their two countries into a war that neither side would benefit from. "Let's sit together to talk to find a solution," Khan said. There was no reply from Modi, but India acknowledged one of its air force planes was "lost" in skirmishes with Pakistan and that its pilot was "missing in action." 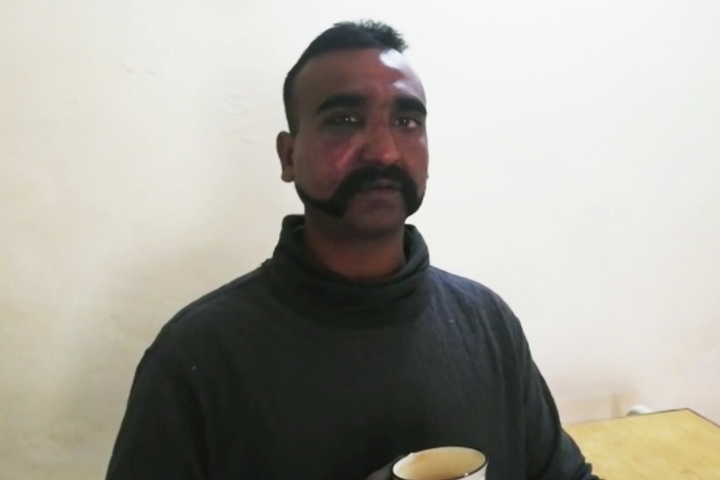 Pakistan's military later circulated a video of a man with a mustache who identified himself as the Indian pilot, sipping tea and responding to questions, mostly by saying, "You know I can't answer that." He appeared in good health as he was questioned about his hometown, his aircraft and his mission. The downing of the Indian aircraft came on a chaotic day that also saw mortar shells fired by Indian troops from across the frontier dividing the two sectors of Kashmir kill six civilians and wound several others. A helicopter crash in the region also killed six Indian air force officials and a civilian on the ground. Pakistan responded by shutting down its civilian airspace. 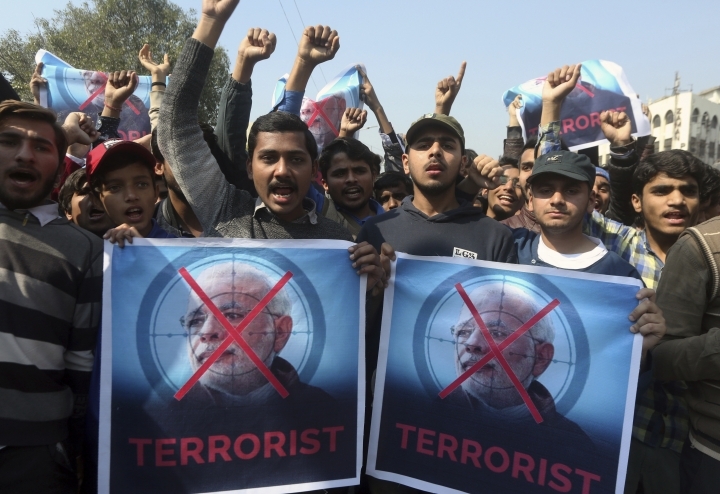 The Indian warplanes went down Wednesday morning in Kashmir, a mountainous region claimed by both India and Pakistan since almost immediately after their creation in 1947. 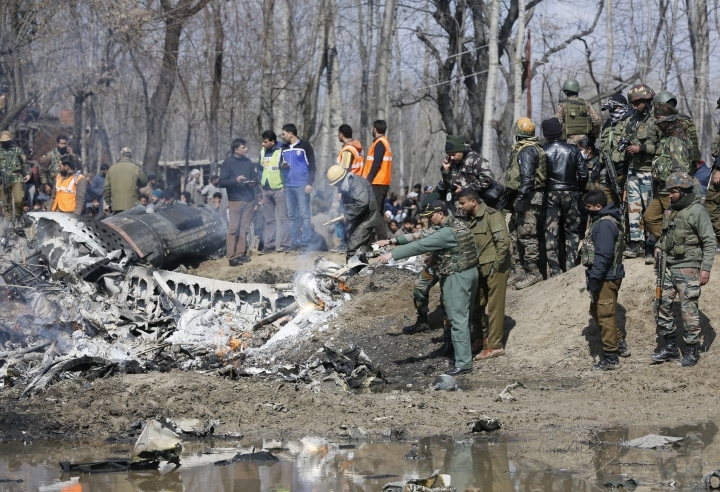 One of the downed planes crashed in Pakistan's part of Kashmir while the other went down in an Indian-controlled section of the Himalayan region, Pakistan's army spokesman Maj. Gen. Asif Ghafoor said. He said Pakistani troops on the ground captured the Indian pilot. He had said earlier that two pilots were captured, but did not explain the discrepancy. "We have no intention of escalation, but are fully prepared to do so if forced into that paradigm," Ghafoor said. 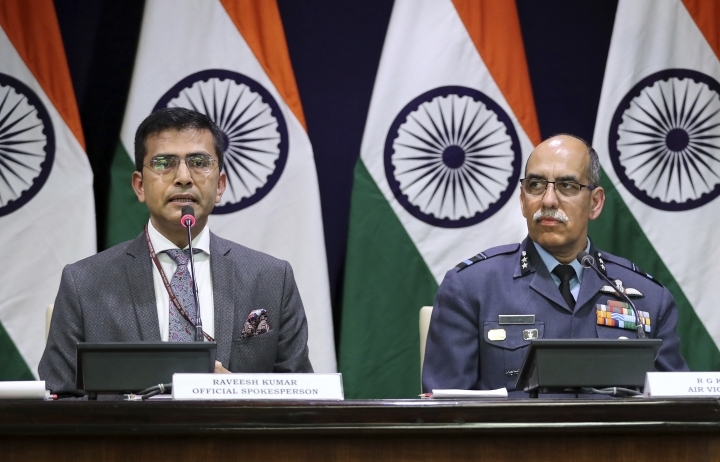 India's External Affairs Ministry spokesman, Raveesh Kumar, said one of India's MiG-21 fighter aircraft was missing and India was still "ascertaining" whether its pilot was in Pakistan's custody. He said one Pakistani aircraft was shot down, something Pakistan denied. 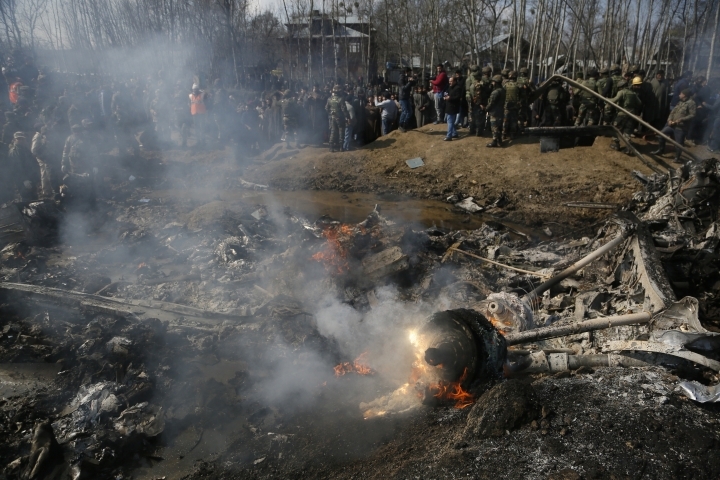 Meanwhile, Indian police said officials recovered seven bodies from the wreckage of the Indian air force chopper that crashed in an Indian-controlled sector of Kashmir, including six Indian airmen and a civilian on the ground. They gave no cause for the crash. 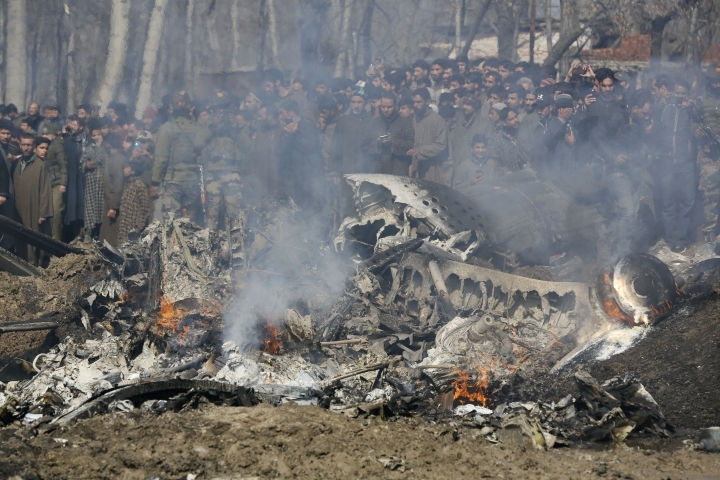 Senior police officer Munir Ahmed Khan said the chopper crashed close to an airport in the Budgam area, on the outskirts of the region's main city of Srinagar. The Srinagar airport, which was shut along with two other airports for civilian flights in the region, is also an air force station. Witnesses said soldiers fired in the air to keep residents away from the crash site. Meanwhile, the Foreign Ministry in Islamabad said the country's air force was carrying out airstrikes Wednesday from within Pakistani airspace across the disputed Kashmir boundary but that this was not in "retaliation to continued Indian belligerence." 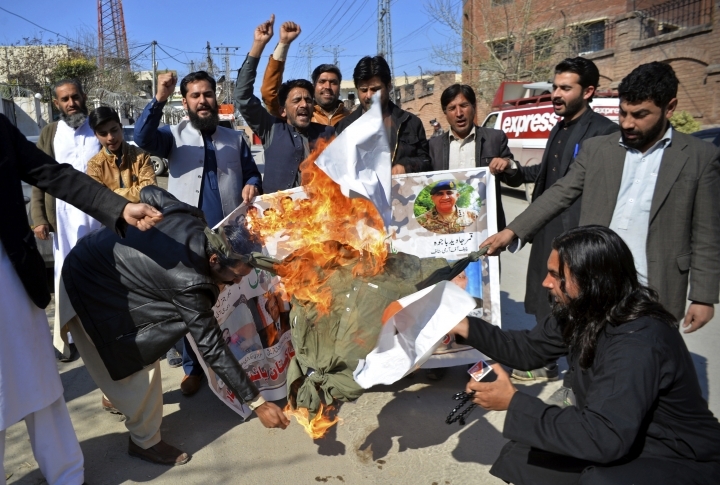 Ghafoor, the Pakistani military spokesman, said the strikes were aimed at "avoiding human loss and collateral damage." The shelling earlier Wednesday by India hit the village of Kotli in Pakistani-controlled Kashmir, killing six civilians, including children, local police official Mohammad Altaf said. Kashmir is split between Pakistan and India and claimed by both in its entirety. 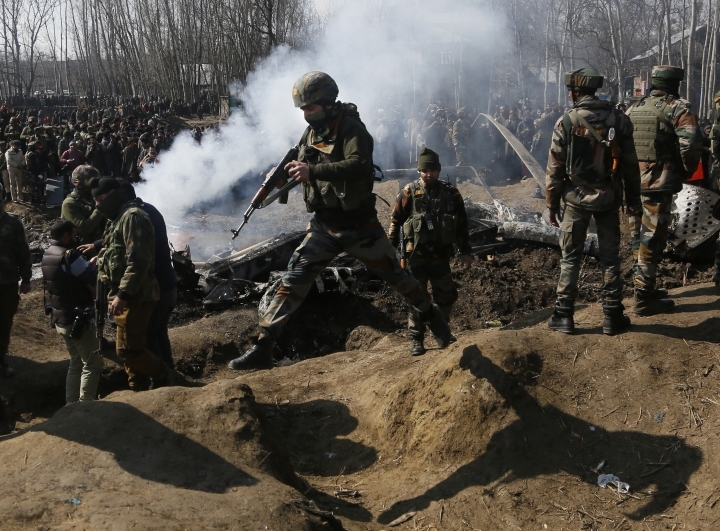 Though Pakistani and Indian troops in Kashmir often trade fire, the latest casualties came a day after tensions escalated sharply following a pre-dawn airstrike and incursion by India that New Delhi said targeted a terrorist training camp in northwestern Pakistan. 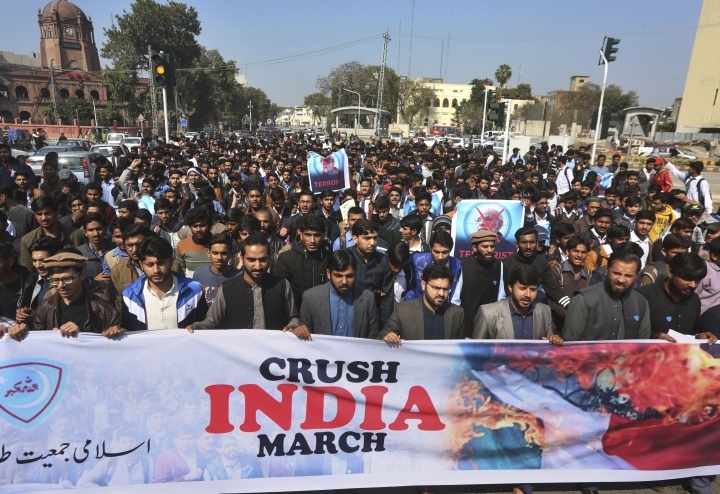 The strike Tuesday was India's first inside Pakistan since the two nations' 1971 war over territory that later became Bangladesh. Pakistan said Indian warplanes dropped bombs near the Pakistani town of Balakot but there were no casualties. The violence Wednesday marked the most serious escalation of the long-simmering conflict since 1999, when Pakistan's military sent a ground force into Indian-controlled Kashmir at Kargil. That year also saw an Indian fighter jet shoot down a Pakistani naval aircraft, killing all 16 on board. Residents on both sides of the de-facto frontier, the so-called Line of Control, said there were exchanges of fire between the two sides through the night into Wednesday morning. 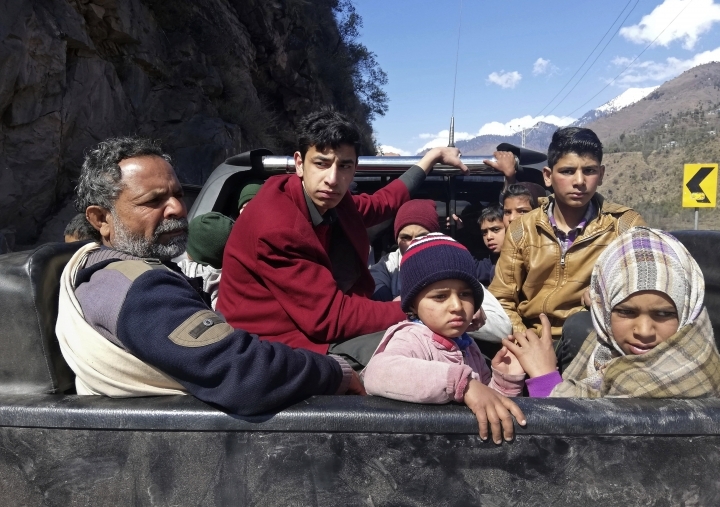 Hundreds of villagers fled border towns in both India and Pakistan. In New Delhi, Indian officials said Wednesday at least five of their soldiers were wounded in firing by Pakistani troops along the volatile frontier. 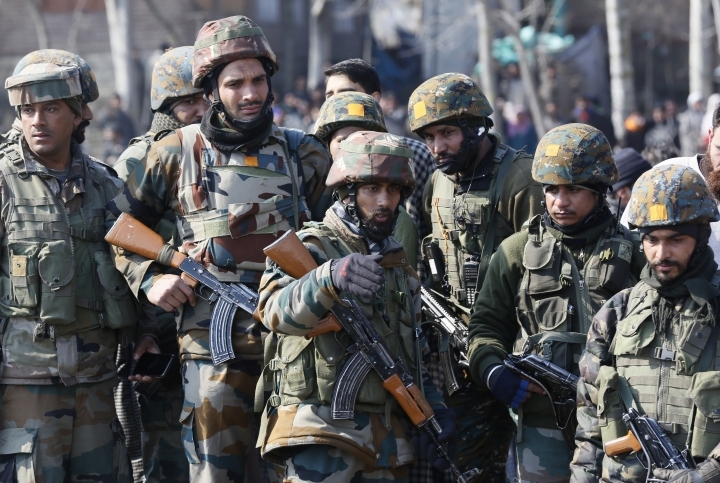 Lt. Col. Devender Anand, an Indian army spokesman, said Pakistani soldiers targeted dozens of Indian military positions across the Line of Control throughout the night. An Indian military statement said that "out of anger and frustration," Pakistan initiated an "unprovoked cease-fire violation." 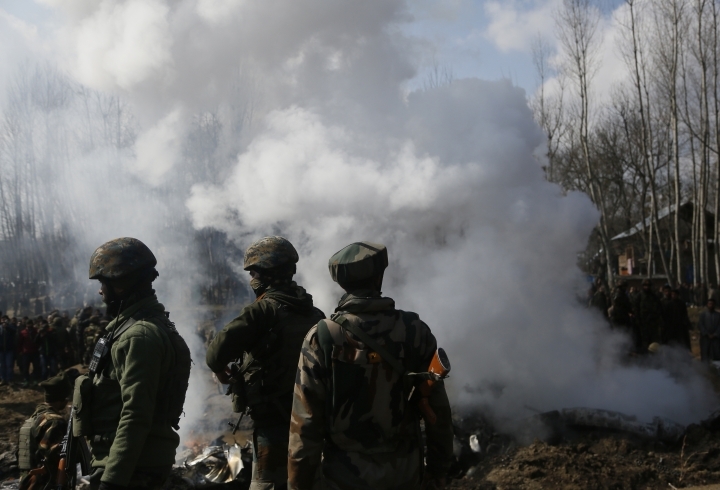 The statement said Indian troops "retaliated for effect" and claimed to have destroyed five Pakistani posts. It accused Pakistani soldiers of firing mortars and missiles "from civilian houses, using villagers as human shields." 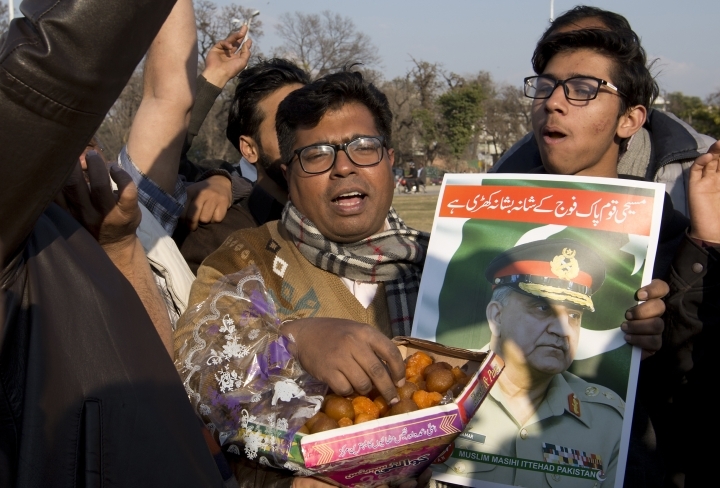 On Wednesday, Pakistan's foreign minister, Shah Mahmood Qureshi, told state-run Pakistan Television he was in touch with his counterparts across the world about the "Indian aggression," adding that New Delhi had endangered peace in the region by Tuesday's airstrike inside Pakistan. India's external affairs minister, Sushma Swaraj, said Wednesday her country does not wish to see further escalation of the situation with Pakistan and that it will continue to act with responsibility and restraint. She said the limited objective of India's pre-emptive strike inside Pakistan on a terrorist training camp Tuesday was to prevent another terror attack inside India by the Jaish-e-Mohammad extremist group. 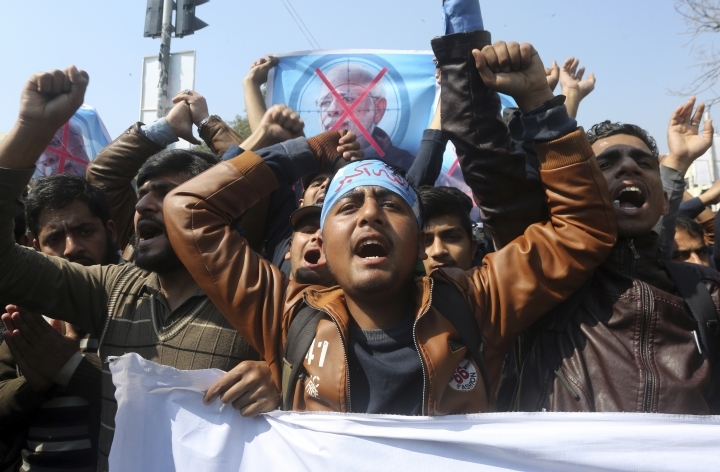 The latest wave of tensions between Pakistan and India first erupted after Jaish-e-Mohammad claimed responsibility for a Feb. 14 suicide bombing on Indian paramilitary forces on the Indian side of Kashmir that killed more than 40 troops. 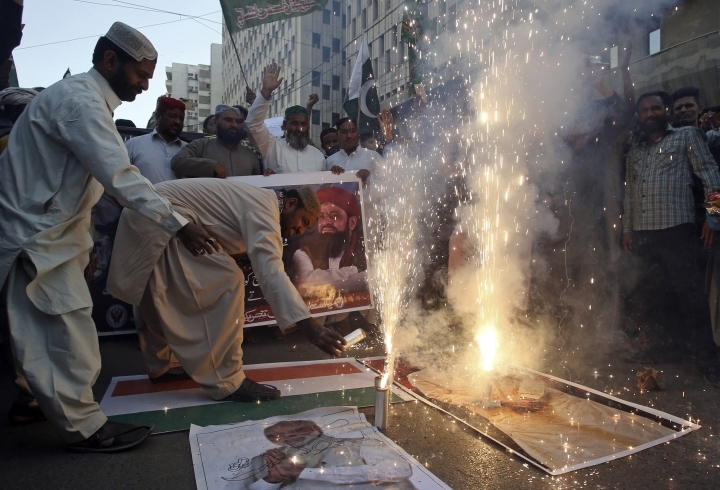 India long has accused Pakistan of cultivating such militant groups to attack it. Pakistan has said it was not involved in that attack and was ready to help New Delhi in the investigations. Hussain reported from Srinagar, India. 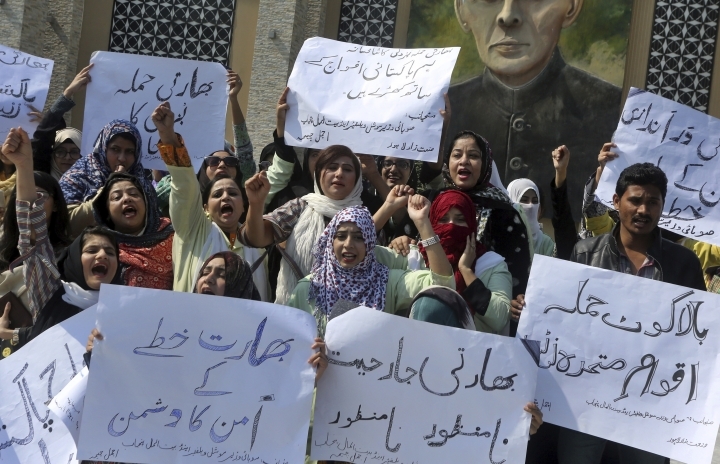 Associated Press writers Ashok Sharma in New Delhi and Kathy Gannon and Munir Ahmed in Islamabad contributed to this report.